This guide focuses on one area of intellectual property law, copyright law, and identifies print and electronic materials on the American federal copyright law system, focusing on the Copyright Act of 1976. With the information explosion of the 21st century, copyright law is now considered a central element of the nation's information economy. Whether the issue is downloading music or distance education, traditional copyright principles are being applied to new technologies in a way few could have predicted. This research guide helps its readers select useful print and electronic materials on the American copyright law. The guide focuses on the Copyright Act of 1976, but refers to other intellectual property fields and international copyright where applicable. We usually recommend starting your research with secondary sources such as treatises or legal encyclopedias. Practitioner tools, journals, and news sources that cover copyright issues are also discussed on that page. This research guide also includes information on federal statutory and regulatory sources of American copyright law (including copyright legislation), guidance on finding case law, and information about copyright organizations and associations (a list of government, private and advocacy organizations that consistently deal with copyright issues). This page provides a few introductory tips on starting research into copyright law, including links to some of the most useful pages on the U.S. Copyright Office's website. The U.S. Copyright Office website is a good, introductory source of information about U.S. copyright law and how to register a work. From the site, you can download forms (many of which you can complete online before you print them out), instructions, legislative information, and primers on the Copyright Act and how it applies to different types of works. Copyright Basics: This document is a useful introduction to American copyright law and process. It explains a number of topics, including what copyright is, what copyright protects, the scope of copyright's notification provisions, and how long copyright lasts. It is also available in Spanish. Circulars and Fact Sheets: U.S. Copyright Office Circulars, such as Copyright Basics, and fact sheets are short, introductory, plain language documents providing information on specific topics, such as registration procedures, fees, notice, and more. Frequently Asked Questions: Provides basic information about copyright law and the U.S. Copyright Office and its operations. Copyright Laws: Provides all of Title 17 of the United States Code. Users can download the entire Title or specific chapters. Copyright Registrations: The Copyright Office allows users to search registrations and ownership documents from 1978 to the present. For more information, especially on researching pre-1978 records, see Circular 22: How to Investigate the Copyright Status of a Work. Legislative Developments: Pending copyright legislation. The Compendium of U.S. Copyright Office Practices (3rd ed. ): The governing administrative manual for registrations and recordations. The Third Edition (2014) represents the first comprehensive overhaul and restatement of the Copyright Office’s practices and standards in over 25 years. The Copyright Office Fair Use Index. For a brief introduction to and overview of the Fair Use Index, see our blog, Due Process. 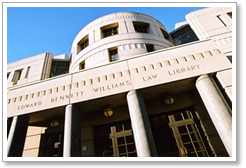 Generally, the library keeps its print collection of copyright law material in call numbers KF2986-3080. The leading treatise on U.S. copyright law is Nimmer on Copyright, which is available electronically only on Lexis Advance. For other treatises and study aids on copyright law, both print and electronic, refer to the secondary sources page of this guide. You may also find our intellectual property treatise finder helpful. These pages collect all copyright-related materials (primary and secondary sources) available in each research platform. Note that secondary source selections, particularly with regards to texts & treatises, will differ dramatically on Westlaw and Lexis, so it's best to check both. Westlaw groups all IP resources together here. Browse to specific types of resources (e.g. treatises, cases, laws, regulations) on the left to then find the copyright-specific sources broken out.